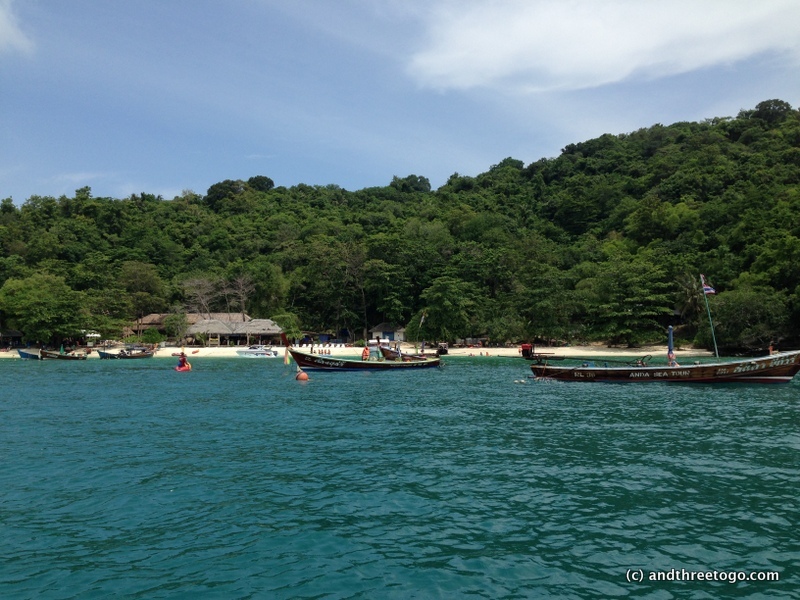 Here in Phuket, Thailand there are numerous island easily reached with a short boat ride. We have decided to make the best use of our possible time left here, so we are starting with day trips close to our home in southern Phuket. 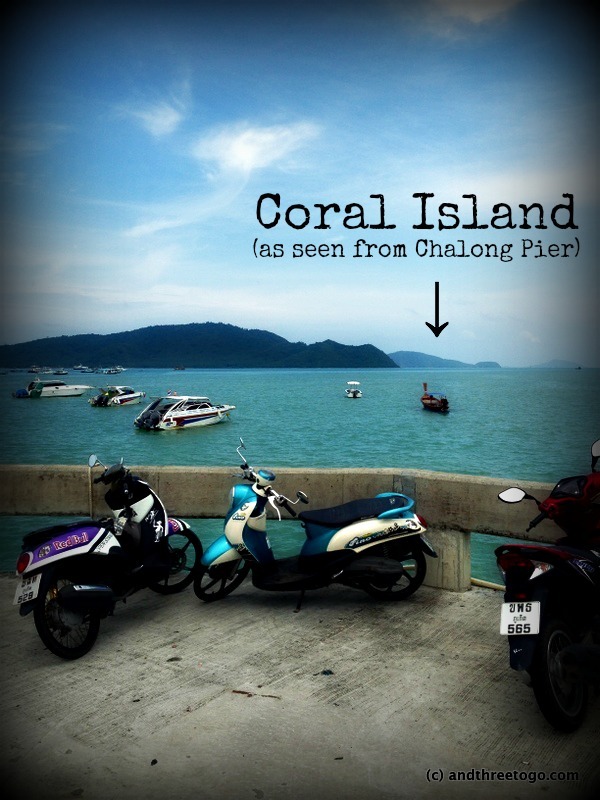 The first choice on our list was to visit Coral Island (Koh Hae in Thai) as it was highly recommended to us by everyone we know. 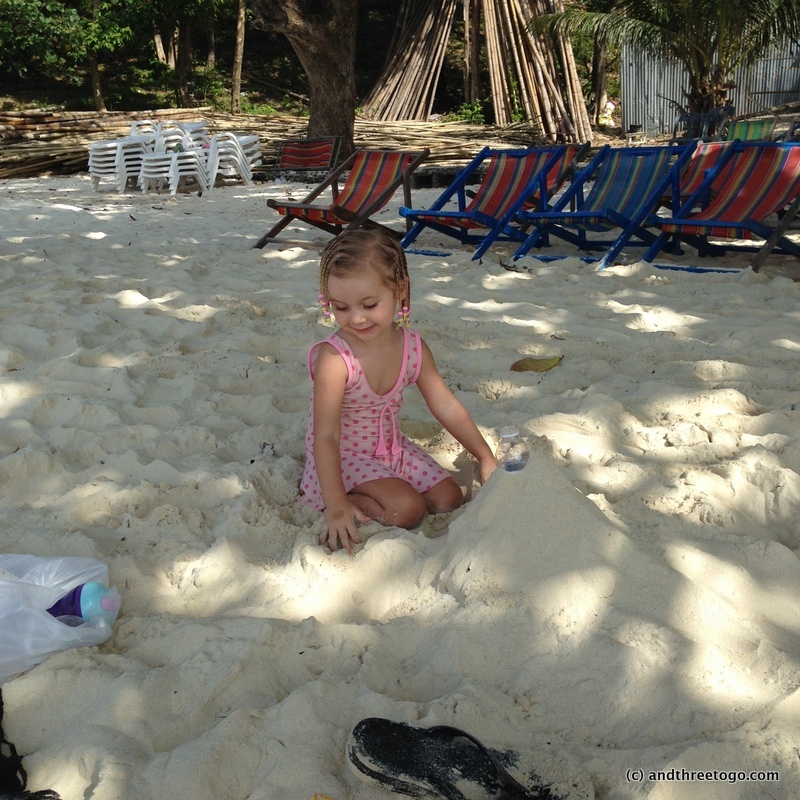 Coral Island is a small island southeast of Phuket. It’s english name is Coral Island because of a resort by the same name residing on it, not because it is surrounded by coral. We made a cardinal mistake that day and decided to just head to Chalong Pier with all of our stuff in tow for our day trip. We figured since it is low season here in Thailand, that we would get a good deal. Well, one thing you should never do is look too eager or ready for an excursion if you want a ride. The drivers, boat captains, or whatever other service you need, will usually overcharge you as you have the “tourist” look and are a supposed easy target. Even after being here in Thailand on and off for the last 10 months, we still fell for it. We were severely overcharged for our long tail boat ride to Coral Island. The normal rate (in high season) is about 1200 baht ($38 USD) but we were charged 2000 baht ($63 USD). We made a rookie mistake and paid for it. If you decide to go to Coral Island, find a tour group office, or ask someone at your hotel for help finding a person that will ferry you over to the island. We hopped into our long tail boat feeling a bit sheepish about getting taken monetarily, but still excited to be on an adventure. Long tail boats are simple long wooden boats that have a gas-powered outboard motor that is steered by the rudder which is at the end of a long “tail” of the back of the boat. 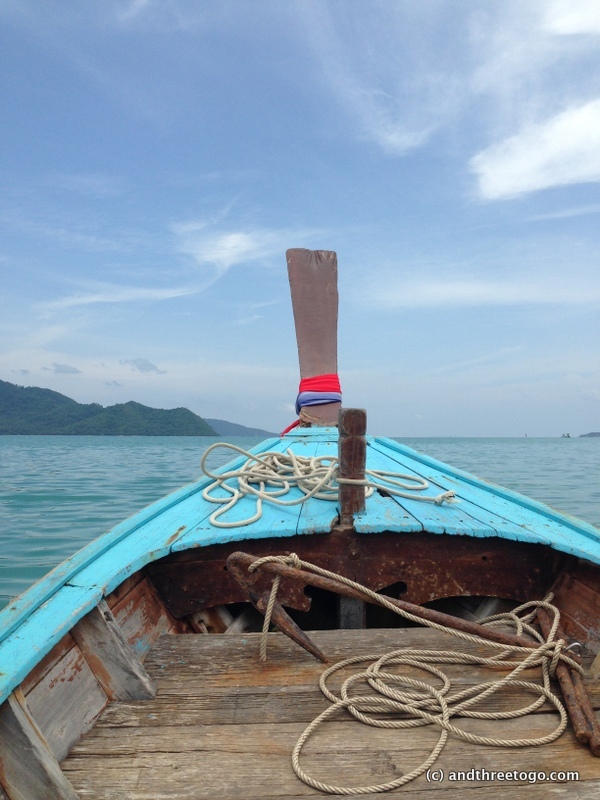 I am not that comfortable on the water usually, but I always feel safe on long tail boats. The captains are able to maneuver them extremely well so that they do not rock much and that makes me feel very safe. My view from the front seat of the Long Tail Boat. Chad and Z are excited! The boat ride only lasted about 20 minutes and was smooth and lovely. The day was not too hot, the air still, and the waves nonexistent. Perfect! We came up to the island and saw that there were two beaches right next to each other. The one on the right, Long Beach, was much more crowded, and was surrounded by speed boats waiting to take tourists parasailing and on banana boat rides. It is also where the Coral Island Resort is. If you want water sports and a good party, then Long Beach is where you should go. We decided to check out the beach on the left, called Banana Beach. Banana Beach was much less crowded and there were no extreme water sports offered, unless you count snorkeling and scuba diving. There was a large area roped off for swimmers and snorkelers and boats were not allowed in that area which made it much safer for swimming. I just can’t imagine trying to snorkel and having to keep my eyes open for a speed boat about to crash into me at the same time. Banana Beach has a restaurant and bar, nice free showers and bathrooms, and chairs, tables, and umbrellas all available for rent. There were ample places to lay in the shade for free though, so we laid out our sarongs and made ourselves comfortable before taking turns going out and snorkeling. The snorkeling was pretty good. But even better were the tropical fish that came so close to the shore that Z was able to feed them easily while she floated around on her water wings. It was the highlight of our day! Well, I guess I should say one of them, at least for Z. We were laying on the beach when a lady came by offering hair braiding and fingernail painting. 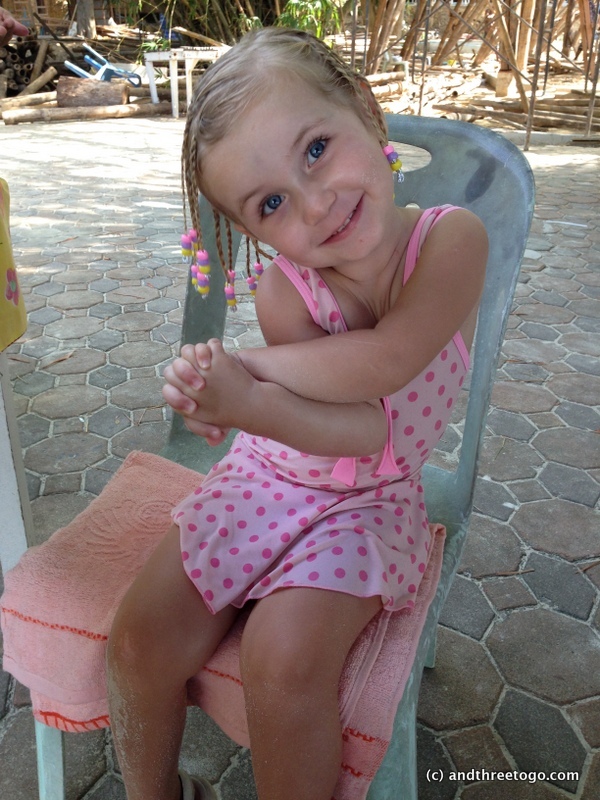 We had never considered getting Z’s hair braided as she had never shown any interest. Well, she showed interest that day and soon enough she was sitting and getting pretty little braids with beads over her whole head. 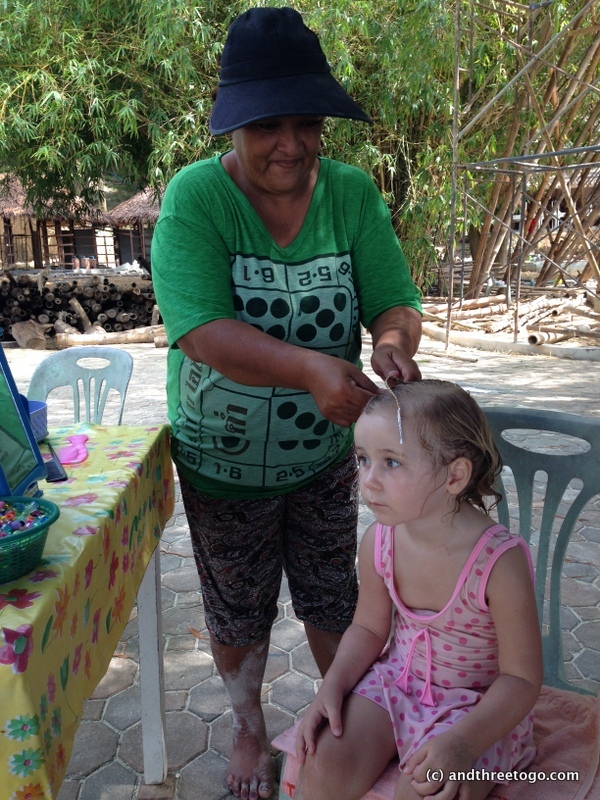 She was thrilled and it only cost us 500 baht ($16 USD). Big girl getting her hair braided. The finished hair on a happy girl! Playing on the beach with her new hairdo. Before we headed back home after a long afternoon of playing in the water, we decided to get a snack. We ordered a Papaya Salad (Som Tam) from the restaurant. The prices are a little high on the island as there is no other place to go. If you are on a tight budget, make sure to bring a picnic (and your own drinks) with you. I will say though that the som tam was some of the best I have had. All-in-all we loved our trip to Coral Island and want to go back again soon. The next time though, we are going to plan a little ahead and make sure to pack a picnic and schedule a boat instead of just showing up at the pier. Besides that it was a perfect day! 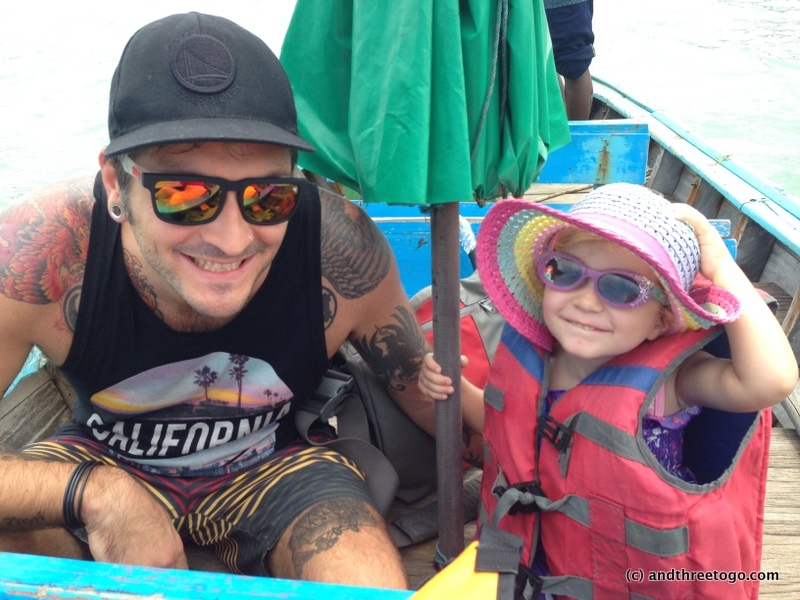 Have you ever been on a long tail boat? Or had your hair braided like Z’s was? Maybe you have been to Coral Island and have more to share? Leave a comment and let me know! See we know that and for some reason we got stage fright or something. Looks lovely! Important tips about not having a tourist look on your face. You can save a lot of money that way. Definitely! Thanks for stopping by and commenting! Sounds like paradise – feeding those fish from the water must have been a lot of fun. See – this is the trip we should have done. Why didn’t the tour agent arrange this trip for us? But we won’t go on about that again. Looks fab. Gotta love fish that come right up to you! You know, funny enough, I used to get scared that the fish would nip at me or something. It made me very nervous. That’s got to be a good thing! I can definitely understand mask claustrophobia – I’m not a huge fan of those mask things, either. Wow, what a fun adventure! It looks so beautiful! 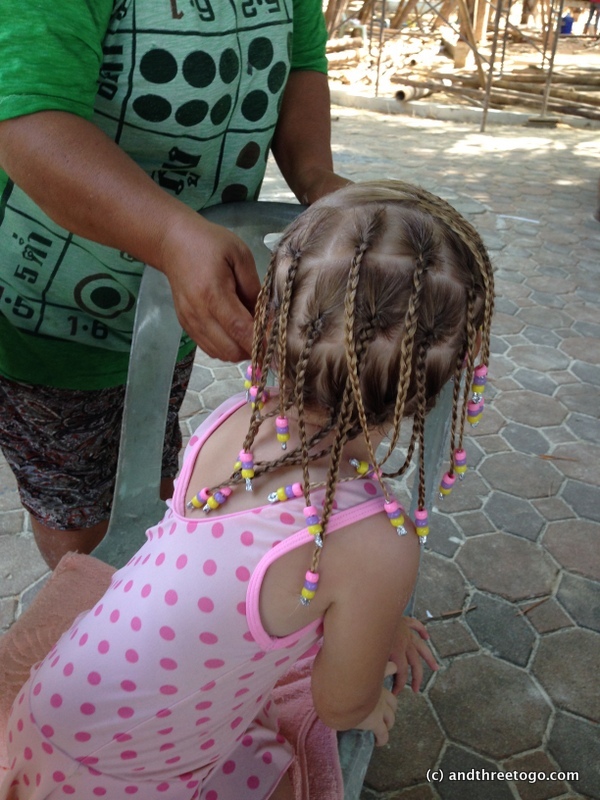 I think my daughter would have wanted braids too-and she would have gone nuts over feeding fish! Oh she looks so cute with the braids! And l love that picture with her tilting her head, what a little poser :-). I’ve been on one of those things and l would never do it again. I almost sank the boat, l can’t swim and was so nervous. The water was just too close.. Glad you had a great day. Doesn’t she though. And she is a total poser haha. 🙂 how did you almost sink the boat?! Oh my! That would be scary! We were supposed to get on in sequence so as not to tip the boat, but l was so nervous, l climbed in and went to my husbands side tipping it precariously. The handler yelling in Maltese, the other couple yelling in Chinese made me so nervous. I don’t blame her one bit for posing..lol.. I loved reading all about your adventure–even if you were a little over charges. 😉 Z’s hair looks adorable!!! Oh, I am so honored!! She’s adorable with her new ‘do. I was on Mexico once when a lady offered the same beauty services. I declined. But now I wish I went ahead with it. It would’ve been fun to sport some cool braids! I’ve recently been on a long tail boat but I can’t give any details as of yet except, it’s very nice! I’ve had my hair braided and I look lovely but here in Germany, only Americans and Dutch Salon owners really know how to do it and that means super-duper prices of the cough-cough variety!